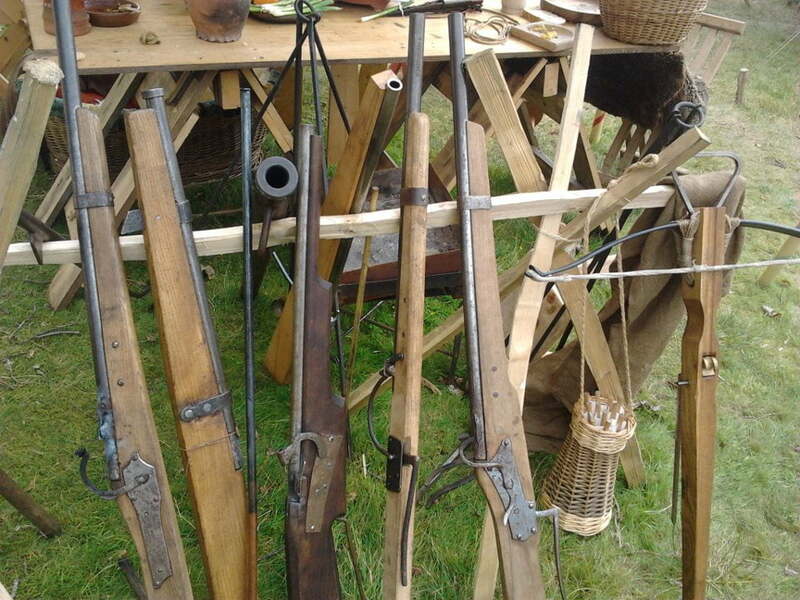 We can demonstrate the development of medieval fire power with our range of field pieces and handguns. “Trinity” is a triple barreled, breech loading gun. The multiple barrels and breech loading system gives a rapid rate of fire. Gun carriages are used to adjust position and angle of fire on the field. For transportation the carriage could be broken down and packed onto a cart or carried by oxen. 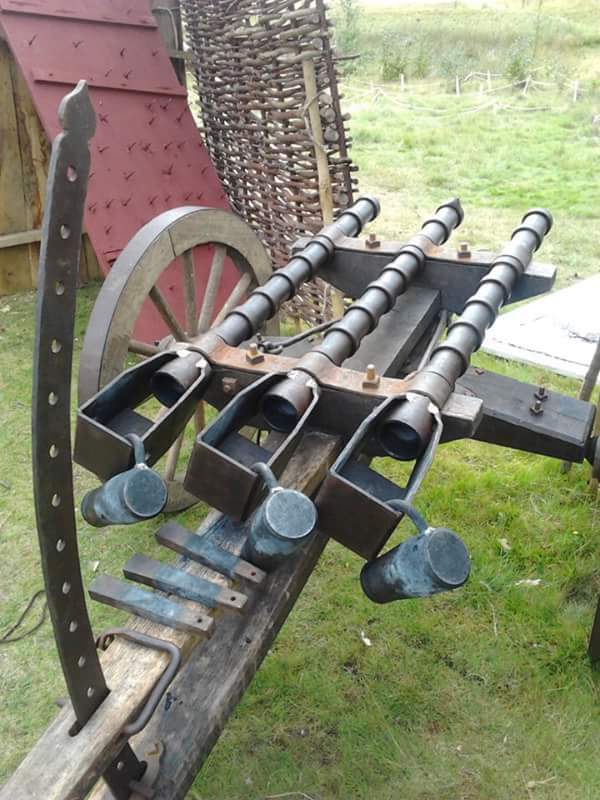 Trinity is based on a find recovered from the sea so may have been a ships gun originally which would explain why the barrels can be angled downwards. “Peggy” a muzzle loading cannon. Painted in a modern substitute for the lead oxide paint that was used by the Duke of Burgundy on his gun train which gives her a distinctive pink colour. 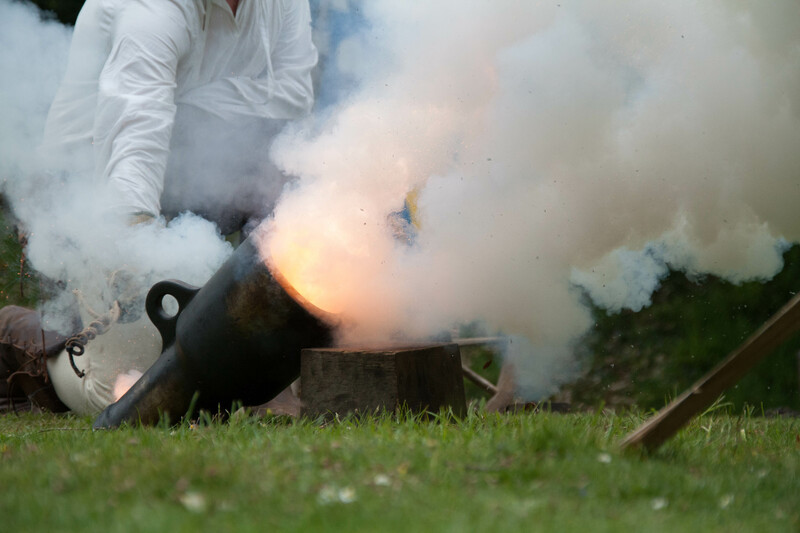 Pestereau (or mortar) a short, wide barrel that can launch a projectile high to drop on a target. This is a replica of a piece dating from the late 14th/early 15th century. If is a copy of an example from the Duke of Burgundy’s armoury. As with the originals this piece has been cast in iron from a mold. Marie – with a barrel weighing 32lb and 900mm in length this is the largest of our hand guns. The term hand gun is applied to a weapon not on a carriage or sled rather than one that is hand held. 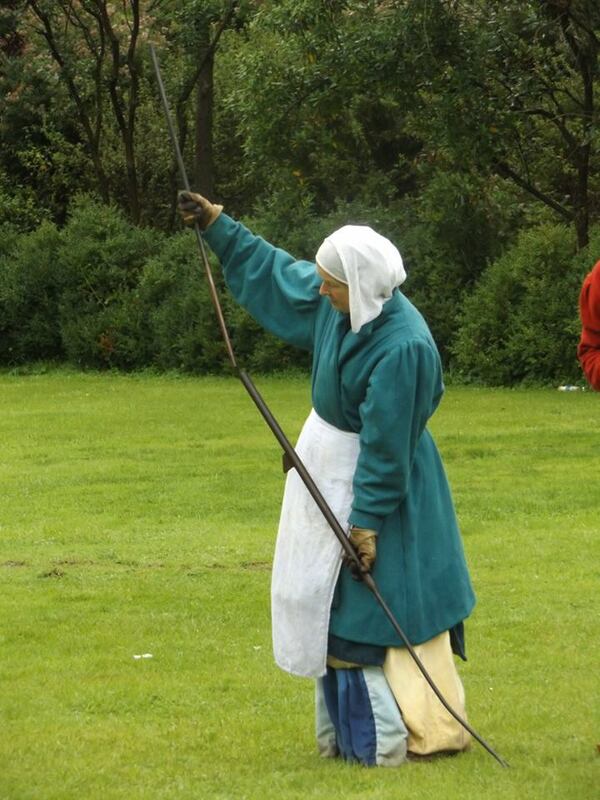 With the oak tiller attached Marie is over 6 foot long with a hook projecting from the barrel that can be hooked over fortifications to take the recoil. 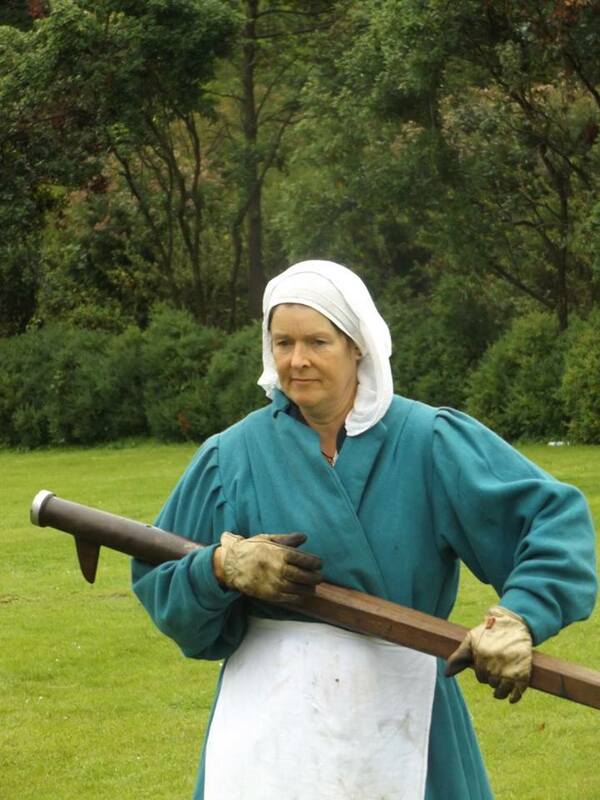 She is based on a type of gun dating from circa 1465-1480 when this style fell out of fashion as while to was a useful siege piece it was found to be ineffective on an open battle field. Pole Guns. We have several pole guns in a variety of sizes. A simple design consisting of a metal “head” or pole attached to a stock. There is no firing mechanism, just a simple touch hole. 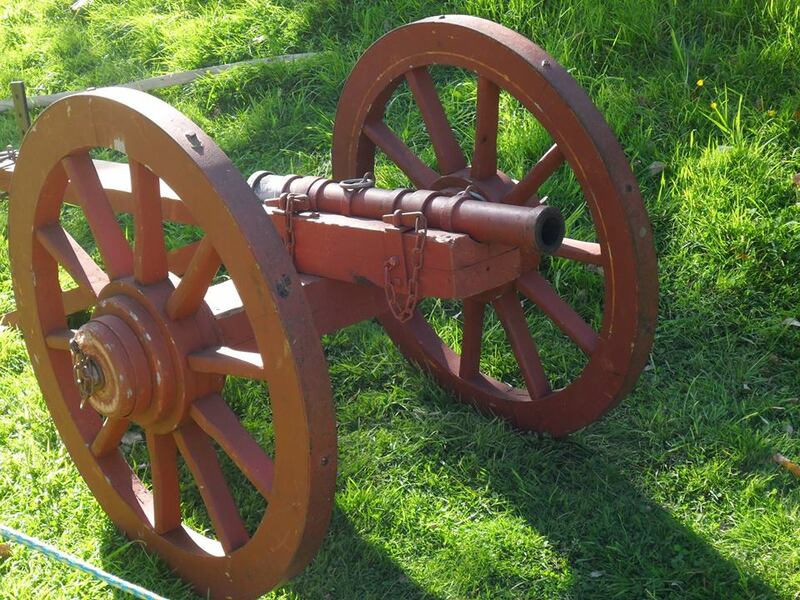 These were defensive pieces often fired from the confines of a castle, gunners would have suffered hearing damage as a result of firing such noisy weapons in such small spaces (it probably harmed their mental health too!) Examples were recovered from the Mary Rose with wax sealing the barrel so they could be preloaded and easily stored until needed. Hand gonnes (resembling muskets of later periods). A longer barrel mounted on top of a stock with the addition of a “lock” or firing mechanism. The compagnie has hand gonnes with several different types of lock, including a push button and a tiller similar to a crossbow. From the earliest pieces in the mid 14th century the weapon developed rapidly through the period until it was replaced by the arquebus in the late 15th century. “Beryl” a simple gun made from a piece metal rolled at one end to create a barrel and solid at the other end to give a stock. The small metal spike on bottom could be hooked over a wall, window or pavaise to steady the gun. It was later misidentified as a defensive measure that could be used to hit attackers at close quarters. This lead to this type of gun becoming known as a hackbut.